This is another series that has been on my to-read list for a pretty long time. When a colleague was cleaning off her desk and asked if I wanted to have the first three books, I said yes. One day during my lunch break, I forgot to bring my current book so I picked this up. Two days later I was done. It was good. Almost great. But it was not quite great for a couple of reasons. There were points when I could tell reveals were supposed to be shocking and crazy…but I had figured it out a chapter or two before. 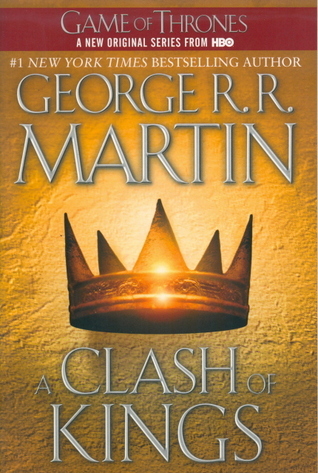 Or one of them I figured out ⅓ of the way through and it wasn’t revealed until there were less than 100 pages left. So that was disappointing. There was also a lot of exposition…which is only a half bad thing. When learning about a new world, I get that the reader has to be told the backstory. And at least the main character was learning right along with us. And it was interesting and exciting exposition…but it still slowed the book down a little. I honestly don’t know how it could have been done any other way, but the amount was very noticeable. But enough about the bad. Let’s talk about the good. It isn’t about vampires…but there are vampires! It isn’t about werewolves, but there are amazing werewolves! There are fairies, demons, and most importantly, Shadowhunters. 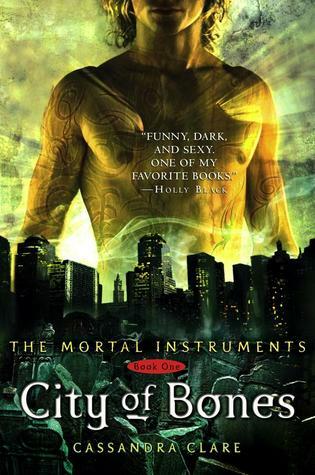 And for the most part, they live in relative harmony (except for the demons who the Shadowhunters are killing). But there is this really bad and evil guy. I mean REALLY evil. Like Voldemort levels of evil. He wants to commit genocide on all Underworld creatures. And kill human children while trying to see if they can be made Shadowhunters. So he is really bad and makes a completely amazing villain! He also has secrets! That I didn’t completely figure out! There is also a totally cute potential romance that made me all kinds of happy and sad. Also, one that is unintentionally icky. When it is going on it is fun and awesome, but by the end of the book…not so much. I look forward to seeing how they deal with it! So, the long story short, check out this book if you haven’t yet. It is fantastic and fun. Clare is a really great writer and I can’t wait to start the next one…right now. 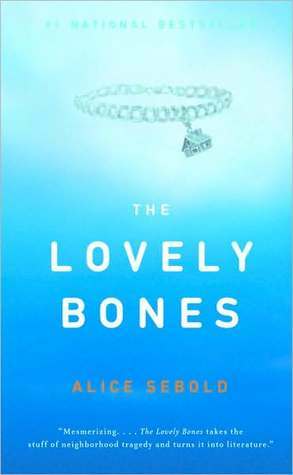 The Lovely Bones is the story of a family devastated by a gruesome murder — a murder recounted by the teenage victim. Upsetting, you say? This book has literally been on my shelf for years. I have wanted to read it since I bought it, but for some reason I was never in the mood. I found the sudden urge to read it and I wish I had done it sooner. There was so much hype around this book and it seemed like it could never live up to it. But somehow it did. The writing is absolutely beautiful. There were sentences that I would read more than once since they were so moving and perfectly written. The story broke my heart, which I knew it would. Yet it was so well formulated and told with such great pacing that i never felt the sadness of it all, I felt the suspense and the beauty instead of the grief. Though at the same time, the grief was also one of the most realistic portrayals I have seen. I know some people that have lost a child and they went through similar emotions and situations. It is not something that you can ever get over and Sebold showed that completely and in a way unlike any I have seen. It is a great book to get lost in. I kept trying to read just one more chapter and 50 pages later, finally put it down to do other things. It was so easy to be invested in the characters and their needs and wants that it was hard to come back to my own. This may be one of those perfect books. There was nothing to dislike. Nothing that bugged me or felt like it wasn’t good enough. It was just amazing and my own words can’t describe the beauty of this book. Did you read it way back when every one else read it? What did you think? I look forward to bumping the movie to the top of my Netflix queue! After seeing the wonderful movie, I had to read the book. And the book did not disappoint. Getting to see the visuals in the graphic novel portion was really amazing. The art is wonderful and is a great addition to the story and enhances it so well. I don’t think this could usually work, but it did here. The writing is great and it is a really enjoyable story. The characters are adorable and so much fun! I have to say, I think the movie made have been better. Isabella was more likable and being able to see the movies really enhanced the entire story. It is a fun book and a great movie, so you should go read and see it! 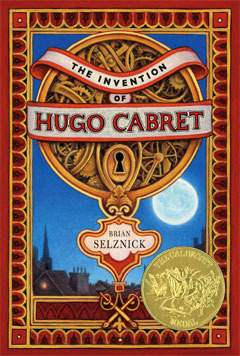 I usually don’t really see why something gets the Caldecott, but this book it just made sense. It was a beautiful, creative book that can be enjoyed by all! I hope everyone has had a nice weekend. On Thursday I left work early because my eye was bothering. Went to eye doctor and I have a cornea infection. I have been doing drops and have only worn my contact two hours all weekend (right now in fact). So there has been a lot of sitting around and stitching and “watching” TV I don’t need to see (aka Star Trek Next Generation). Not much reading I can see close up, but the bright lights I need hurt my eye. My main test for if I could work tomorrow was when I could put the contact in tonight if I could handle the light sensitivity. I went only 25 minutes on my computer and then it hurt. Add in the fluorescent lights at work and I would be useless. Staying home tomorrow for one more day of healing and seeing doctor. If it doesn’t get better, I will be contact-less at work on Tuesday. But that is not how my reading habits have changed. I have only read two books for pleasure this year. The other 6 books I read were all for work. I am not complaining, I get to read books for work and get to read books that are very different from what I normally read. But it has taken away from my pleasure reading and I miss it. I am trying to increase my reading in general. That does means changes to this blog. I schedule a lot of posts months in advance since I am reading for work (I have a review scheduled for September already!). I am reviewing many different types of books and more literary books. So posts will be much more sporadic. There will also be more non-books or editorial posts. I will get used to it and I hope my reading picks up…my to-read list is so long and I want to get to it! How do you deal with having to change your habits? Any tips? Yesterday I was busy and work and got Pulishers Lunch in my email. I read it daily and usually there is nothing I see as important enough to share. Except yesterday there was a possibility for BEA 2013 that had our entire office talking. First, they are thinking about making it run Thursday to Saturday. So, first bad idea. Everyone would have to work the weekend. But many people couldn’t.wouldn’t want to which would mean that all the industry types would need to hold all their meetings and do all their work in two days. They claim it would be easier for booksellers and librarians to make it on a Saturday. What? Really? Last I checked, both bookstore and libraries are not only open on Saturday, but tend to have even more events and traffic on the weekends. So how does this help them? Which comes to the bigger and worse part of what they are looking at. They are considering making that last day open to the public. Take time and rad that last sentence again. Open to anyone. Their thought is that the can make it like Comic Con and let everyone see what their favorite authors are up to, hold more events, and see how publishing works! This is a bad idea for so many reasons. First, the difference between Thursday/Friday and Saturday would be so colossal that everyone would spend Friday transferring their booths to be public-friendly. The difference between what you want to show people who understand the business (booksellers, librarians, and even bloggers) and how you publicize and push things to the public are not the same at all. Second, if you think bloggers (and librarians too) can be grabby, how do you think the public will act when offered free books? I got hit with a bag last year over a book…and regular people would be so much work. As bloggers know, ARCs are illegal to sell. From what I have seen, bloggers do not sell them. The public will, especially any medium to large name. That isn’t good. Also, there is a reason the public doesn’t get to see them. Industry-types understand that it is uncorrected. They don’t review or criticize based on the issues that will be fixed. The public may not get this and that kind of thing will hurt authors. The more author events may be interesting, but during BEA there are events open to the public all around New York City. The bookstores all have many events, the libraries host things, and authors are everywhere. If they want to hold more events, they can, but events in BEA and outside are also different because there are different audiences. Finally, BEA is nothing like Comic Con. At all. BEA is for the industry to make it easier to promote books to the people who work with publishers to increase sales. Promoting to the public is completely f=different. If they want to have a convention for that, great. But it needs to be completely separate.